Today was our monthly CQTeers meeting where we eat far too much chocolate, laugh a lot, have grand discussions, and learn a thing (or three) along the way. Our theme this month was to create something using the faux butcher's twine we learned to make last month from the tutorial on THIS blog. The flower on the upper left was mine, loosely taken from a free PrickandStitch pattern from HERE. On the upper right is the dress form by Sue and Irene created the buxom gal on the lower left. Hers combined not only the butcher twine, but the woven paper technique from the month before, and a couple of paper beads we had learned to do at another meeting. The card on the lower right was from Irene for my birthday (last month) - the back reads "It gets to the stage where you need all your breath to blow out all the candles". Sorry about the flash glare on the pictures! garnered from Ikea on Friday. facelift at some point though. Thanks for the idea Anne!! First, I want to say thank you for all of your input into my lighting dilemma. I was happy to know that Ott lights are better than I had been led to believe (obviously anyone who takes time to do a review generally has a problem). There are a couple of you who have your reponses set to 'no reply' so I am unable to thank you in person. Now it's on to doing the sleeves! My new studio is under-lighted and I am needing to purchase a new floor lamp to create a much better quality of light. My former studio had three double-bulb 'daylight' fluorescent ceiling lights and I miss them tremendously. Living in an apartment means that I won't be able to replace the ceiling fixture (besides, I need the fan that comes with the light) so whatever I get will have to be a floor standing model. I've been looking around on the internet and at first I thought I would like an Ott light but I've read some pretty discouraging reviews so I will probably give them a pass. They're expensive, the ballast doesn't last and, by the reports I've read, their customer service is rather lacking. I need a lamp that preferably is a 'daylight' one, it must be stable, and throw a lot of light. Do you have any ideas of what I should look at? Makes & models would be most welcome. Thank you in advance! for use in my jackets. One of my awe inspiring friends is running her first online course and if you are an admirer of Karen Ruane you NEED to have a look at her announcement on her blog HERE. (scroll down). Some of you will remember the fabric journal class I took online from Carole Brungar last year (and how much fun I had!). Well, she's now offering a new class called "The Road to My House" and you can get further information HERE. I can highly recommend any class from Carole - you are guaranteed to have fun and to learn a lot! 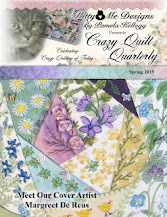 Last, but not least - the latest issue of Pat Winter's 'Crazy Quilt Gatherings' magazine is now available! Go HERE to see further details and order either a PDF or print copy (or both, if you want!). I was asked to write a review of Pam Kellogg's latest seam treatment book for this issue, which was quite exciting. I don't know if you have heard about the foundling swatches and their significance in history. The Foundling Hospital in London England was founded in 1741 for the care of deserted children. Often scraps of cloth were included with the meager records that were kept in the hopes that the children would be reclaimed someday and the fabric pieces could be used as a means of identification. The fact that these fabric scraps have survived all these years is a miracle and a tribute to the strength it must have taken for parents to give up their children - into an uncertain future. Many of them died while at the Hospital, some were adopted, and many more were indentured. There are two very interesting articles with further information HERE and also HERE. It's a significant part of fabric history and well worth reading about. Just a small (ish) mess! And, before you ask, I don't intend to take ANY pictures of the other side of the room!! The jacket hasn't changed all that much from yesterday, other than for the topstitching. Now it's on to reverse stitching things like pockets and labels - the least fun of the whole process. I also have to undertake an archaeological 'dig' to see where on earth I might have put the makings for the sleeves. Thanks to everyone who weighed in on my question of yesterday. 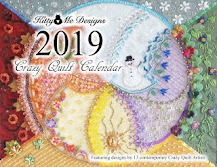 It was interesting to see your take on the subject and I thank those that took the time to look up some 'proper' definitions of crazy quilting. I think I will conclude that the jackets are, in fact, crazy PATCHED but not crazy QUILTED, which makes me feel happier about the definition. 1. The newest issue of CQMagOnline is out and is full of wonderful articles and eye candy. I know it's been out for a couple of weeks but I'm just now getting around to letting you know. Have a look HERE. 2. Karen from Contemporary Embroidery is doing some jaw-dropping work combining paper and fabric. Go HERE and check out her blog. Be sure to scroll down!! Along with my wee bear, Michelle included the little birdie tags and a couple of nice buttons. You can see more of Michelle's work at her blog HERE. 4. Just to prove that this sort of talent runs in the family, Michelle's daughter Avery Hill has started a blog showing her work and is currently having a giveaway. Go HERE to have a look, say hi, and leave a comment to enter! Be prepared to drool over buttons. 5. Finally, my eternal debate with myself....are the jackets I make really crazy quilted or aren't they? Please weigh in on the subject and let me know what you think. These pictures show the back (top picture) and two fronts of the current jacket I'm working on. The question arises from the fact that I piece the recycled denim in the same manner as a crazy quilt. From there the lines become blurred. The seams are 'decorated' but with yellow thread used as topstitching - no hand sewing, no embroidery. Any further embellishment is done with the addition of pockets, labels and buttons. So....what say you? Are these crazy quilted....or not?? Today I thought I'd show you what I can see when I look out my studio window. This is the Scugog River which runs through our town. Further down there is a lock and we do see a lot of boats going up and down. If you look really close in the last picture you can see some of our resident mallard ducks. The middle picture shows some of the guest parking lot that runs in front of our building. We needed a new (or at the least, new to us) end table for between our chairs in our new living room. We looked in several places and finally discovered a nice one in our local Buy & Sell shop but we didn't like the colour of it. Above is a more-or-less 'before' picture. The table had good bones, but didn't fit with our decor as it was. There isn't enough room in our kitchen to house our water cooler, so it has found a home in my studio. Handy when I want a drink! entire wall - it holds my button jars and various other things. could manage to fit it into the space. Happy about that! My inspiration board above and a further view of the upper shelf. That ends the first wall. My sewing area, with a nice window above. serving to hold some of my treasures from friends. beads and also my cotton fabrics, along with some more 'stuff' on top. be nice for me to sit here and read through my crafting books. using the colour suggestions from SharonB. my two art dolls - Shudayra and Annelaw. reside. I know, too much information!! And here is the other side of my closet. Now you're back to the doorway again. I've managed to organize (and stuff!!) a room that measures a mere 10 x 11.5 feet. I'm sure things will change as I start to use the space, but for now I'm pretty happy with it. Moved, and settled - I think! I'm back - I hope! The movers came to move the bigger things that we couldn't lift and of course - it poured rain. In all the places we've lived - it has 'weathered' every single time we've moved. We've grown to expect it! Anyway, most things are in place, the pictures are hung and it's looking like home. I'm very happy to say that my studio (shared space with a pull out couch for guests and the computer) has come together far better than I expected. I've managed to keep all the things that mean the most and there's actually room to walk in here (surprise, surprise!). storage of all this STUFF???? Stay tuned for my next post to see the 'after' photos!! .....so will be off the computer for a few days.